Grey's Anatomy: Is Meredith Finally Over McDreamy And Ready To Start Dating? Last night’s episode of Grey’s Anatomy included some of the best aspects about the medical drama. We begin with a group of surgeons from Grey Sloan Memorial entering a nearby military hospital. In typical Grey’s fashion, there a medical emergency resulting in an unexpected surgery, as well as conflicting doctors arguing about which course of action is best. While this is all pretty standard procedure for an episode of Grey’s, something unprecedented happened toward the end of the episode. 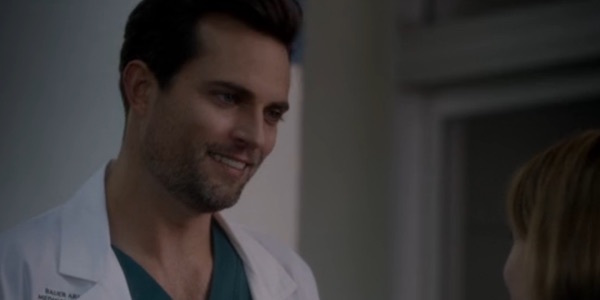 Much of the conflict from this week’s episode of Grey’s Anatomy came from a new character- Major Thorpe. Thorpe was first introduced to our group of surgeons by mouthing off and telling the crew to step away from his patient. As time went on, he continued to be a bit difficult to work with, while also seemingly becoming smitten with Meredith. The end of the episode saw Meredith taking a leap and giving Thorpe her number, while the rest of the group watched with silly smiles. This is really a turning point for Meredith. We haven’t seen her remotely interested in anyone but McDreamy since season 3. At that point, she was involved in a love triangle between Derek and Finn the Veterinarian. Of course, we all know that she eventually broke things off with the Vet, and spent basically the last decade completely focusing on the now deceased Derek Shepherd. Derek and Meredith would continue an on again/off again plotline until their post-it wedding, but Meredith never again looked at another man as a potential love interest. McDreamy fans (aka everyone who has ever watched Grey’s Anatomy) are likely going to be miffed that Meredith is seemingly moving on so soon after Derek’s death. Of course, it isn’t completely crazy considering the timeline of Grey’s. After Derek’s death, Meredith went AWOL for a full year during which she gave birth to baby Ellis. In addition to the year time jump, we also had a few months pass organically, in addition to the months-long recovery that Meredith had after her recent attack. Basically, our McDreamy wounds are fresh but hers perhaps are not. I have to say, as a fan of Grey’s Anatomy, I’m excited to see how Meredith’s upcoming dating life will affect the show. She’s been through a lot. She’s almost died like 12 times at this point, lost all of her family, and is raising two kids. Will she be able to open up to Major Thorpe and relax with someone who doesn’t get her dark and twisty side? Only time will tell. Grey’s Anatomy airs Thursdays on ABC.